Yellow-rumped Thornbills feed mainly on the ground. 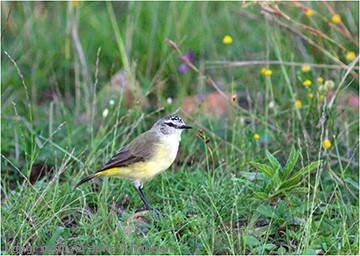 The development of parks and gardens, roadside verges, farming country and the like have all been advantageous to Yellow-rumped Thornbills. 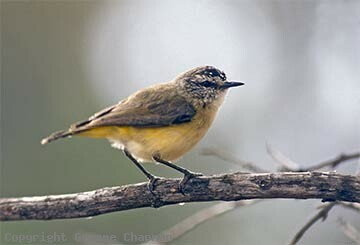 Probably the most widespread of all the thornbills they range through most of southern Australia, including Tasmania in open woodlands, shrublands and even grasslands so long as there is the odd suitable shrub for them to nest in. A favourite site for their large nest is in a thick, usually pendulous section of canopy (like a mistletoe). The nest is a rather unusual structure, not typical of a thornbill, roughly the size and shape of a football with a hooded entrance low down on one side and cup-shaped on the top. Much conjecture has been written about the function of this odd-shaped nest - suffice it to say it does make the entrance to the nest very well concealed and hard to find. They do nest in other situations when necessary - in photo # 386215 the birds were nesting in the crown of a large saltbush which was the tallest vegetation in their territory. Yellow-rumped Thornbills occur in pairs or family groups but in winter may join in mixed flocks with other species. Their beautiful yellow rumps flash brightly in the sun as they hop actively across the ground. They feed on insects and the like with just an occasional seed. When breeding they are territorial and sedentary - territory size varies from about two to nearly ten hectares depending on the quality of the surroundings. 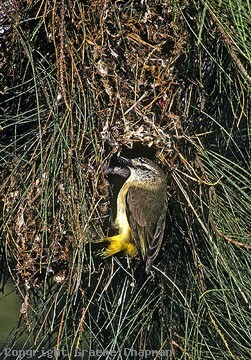 486201 ... Yellow-rumped Thornbill at nest in a sheoak. 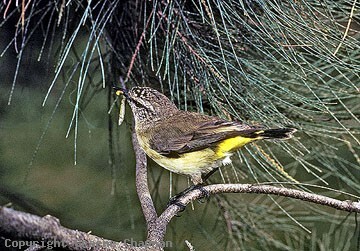 486202 ... Yellow-rumped Thornbill approaching nest.